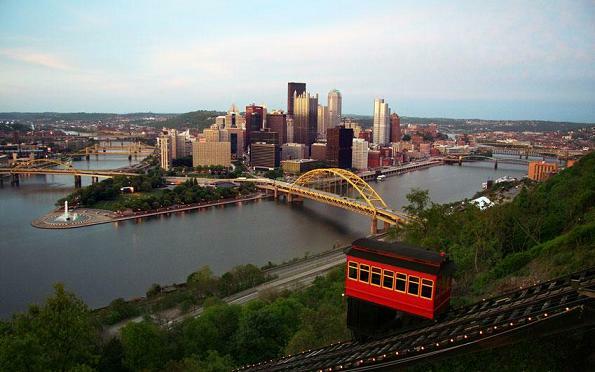 Pittsburgh is the second largest city in the Commonwealth of Pennsylvania. As of the 2000 census, the city itself had a population of 334,569, with 2,358,695 in the metropolitan area. Pittsburgh is built at the confluence of three rivers (the Allegheny River, Monongahela River and the Ohio River), with the downtown area in the triangular portion of land formed by the rivers. The city is well known for its spectacular skyline of skyscrapers and bridges, the latter giving rise to two of its nicknames "The City of Bridges" and "The Bridge Capital". 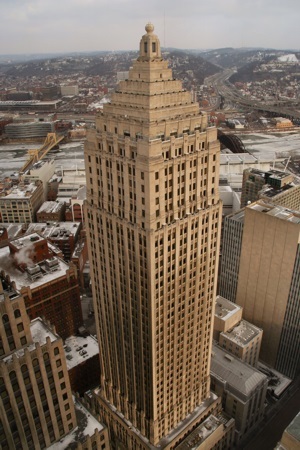 As well as "The City of Bridges" and "The Bridge Capital", Pittsburgh also has a variety of other nicknames, including "City of Champions", "The 'Burgh" and "The College City". There are also nicknames linked to the city's industrial past such as "Iron City", "Steel City" and "Steel Town", and from the new industries that have arisen in the city such as "Roboburgh", which relates to Pittsburgh's growing robotics industry. Probably the best known educational institution in Pittsburgh is Carnegie Mellon University. Carnegie Mellon University is a private research university that was founded by Andrew Carnegie in 1900. Professional sports teams in Pittsburgh include the American football team, the Pittsburgh Steelers, the baseball team, the Pittsburgh Pirates, and the ice hockey team, the Pittsburgh Penguins. Some of the major companies headquartered in Pittsburgh include Heinz, PPG Industries and U.S. Steel. The main airport serving Pittsburgh is Pittsburgh International Airport. Pittsburgh's nicknames include "Birmingham of America", "Iron City", "The 'Burgh", "The City of Bridges", "The City of Champions", "The Smoky City", and "The Steel City". Looking to experience more of America's city life? Try Moon Boston or Moon Philadelphia. Exploring the area? Check out Moon Pennsylvania. Are you excited about planning your next trip? Do you want to try something new while traveling? Would you like some guidance from a local? If you answered yes to any of these questions, then this book is just for you. Greater Than a Tourist – Pittsburgh, PA by Patrick Freed offers the inside scope on Pittsburgh, Pennsylvania. Most travel books tell you how to travel like a tourist. Although there's nothing wrong with that, as a part of the Greater than a Tourist series this book will give you tips and a bunch of ideas from someone who lives at your next travel destination. In these pages you'll discover local advice that will help you throughout your stay. Greater than a tourist is a series of travel books written by locals. Travel like a local. Get the inside scope. Slow down, stay in one place, take your time, get to know the people and the culture of a place. Try some things off the beaten path with guidance. Patronize local business and vendors when you travel. Be willing to try something new and have the travel experience of a lifetime. By the time you finish this book, you will be excited to travel to your next destination. Ten cents of each book purchased is donated to teaching and learning. This is a quirky city notebook designed to inspire listmakers to create their own city guide and city biography in list form and journal the heck out of their time in the city. It's a do it (all) yourself notebook for independent travelers and thinkers! PITTSBURGH DIY CITY GUIDE AND TRAVEL JOURNAL: CITY NOTEBOOK FOR PITTSBURGH, PENNSYLVANIA is a journal and city guide re-invented for travelers, urban explorers and city locals alike! This notebook is a journal and do-it-yourself city guide that helps you keep all your important information about Pittsburgh organized and ready for when you need it and where you need it. Use the pages of this American City Notebook to document your adventures, experiences, thoughts, and memories. Have fun making lists of all the highlights and lowlights Pittsburgh has to offer. This is the perfect place to journal your time in Pittsburgh! This is the perfect place to write down and organize everything you find fascinating about the city - which is why it's your diy city guide and journal. TRAVEL JOURNAL: When you are ready to document your adventures in Pittsburgh, you will find fifty journal pages where you can record key details about the day, weather, locations visited, what happened, thoughts on what happened, notes, and the highlight of the day. Make your time in Pittsburgh more fun, more organized, more productive and more creative by diving headfirst into your new Pittsburgh DIY City Guide and Travel Journal! The restaurants found in this guide are the most positively reviewed and recommended by locals and travelers. "TOP 500 RESTAURANTS" (Cuisine Types). African, American, Argentine, Asian Fusion, Bangladeshi, Belgian, Brazilian, British, Cambodian, Cantonese, Caribbean, Chinese, Colombian, Cuban, Ethiopian, European, French, German, Greek, Hungarian, Indian, Irish, Italian, Japanese, Korean, Latin American, Lebanese, Malaysian, Mediterranean, Mexican, Middle Eastern, Mongolian, Moroccan, Pakistani, Peruvian, Polish, Portuguese, Russian, Spanish, Szechuan, Taiwanese, Tex-Mex, Thai, Turkish, Vietnamese and many more options to visit and enjoy your stay. Long-time Pennsylvania resident Dan Eldridge provides a quirky look at Pittsburgh, from riding up the Duquesne Incline to grabbing a beer at a hipster bar in South Side to visiting the Andy Warhol Museum. Dan includes unique trip ideas like Out with the Parents, Fun and Cheap, and Go Where the Locals Go. Packed with information on dining, transportation, and accommodations, this guide provides options for a range of travel budgets. Complete with details on the best insider spots and how to make the most of two days in the city, Moon Pittsburgh gives travelers the tools they need to create a more personal and memorable experience. Are you planning your next vacation abroad and you’re ready to explore? Do you want to be prepared for everything? Are you ready to experience every new place you visit just like a local? Well, with this amazing Pittsburgh, Pennsylvania (United States) travel map you’re all set and ready to go! The Pittsburgh, Pennsylvania (United States) map was carefully designed to give you amazing results and make traveling easier than ever. We make sure to constantly update our info to give you the most relevant and accurate information, so you will never get confused or frustrated during your Pittsburgh, Pennsylvania (United States) trip. The map is very detailed and it will not only give you all the available roads and routes, but also the essential information to make your Pittsburgh, Pennsylvania (United States) vacation unforgettable. In the Pittsburgh, Pennsylvania (United States) map you will also find the best places to go shopping, the most famous and must-see sights, churches and more. Pittsburgh: 1758–2008 surveys the city’s evolution from strategic fort in the wilderness to bustling industrial workshop to high-tech center for universities and health care. A boatbuilding center and gateway to the West at the beginning of the 19th century, Pittsburgh later produced iron and steel used to construct bridges and buildings around the country and provided the cannons, shot, and ships that helped win wars around the world. In the process, Pittsburgh became a magnet for successive waves of immigrants―workers and entrepreneurs who shaped the culture and character of the city with their customs, churches, clubs, food, and an impressive collection of museums. Among its many attributes, Pittsburgh is the birthplace of Carnegie libraries in the United States, wire cable suspension bridges, the gas station, the Ferris wheel, commercial radio, public television, and bingo. With Moon Pennsylvania's practical tips and local insight, you can experience the best of the Keystone State. Staying in the city? Try Moon Pittsburgh or Moon Philadelphia. Exploring more of the East Coast? Try Moon Virginia & Maryland or Moon Washington DC. Carnegie Museum of Natural History? name from 1891 to 1911? --an interesting little book about a very special place on the planet! Arcadia Kids is a new series of fun, colorful, easy-to-read books for children ages 7-11 featuring attention-grabbing cover art, inviting conversational style content, and vivid full-color images of landmarks and geography. Parents, grandparents, and savvy shoppers will appreciate the feel good factor of purchasing books that are both fun AND educational.